I hope you have had a great week and have not been too chilly! 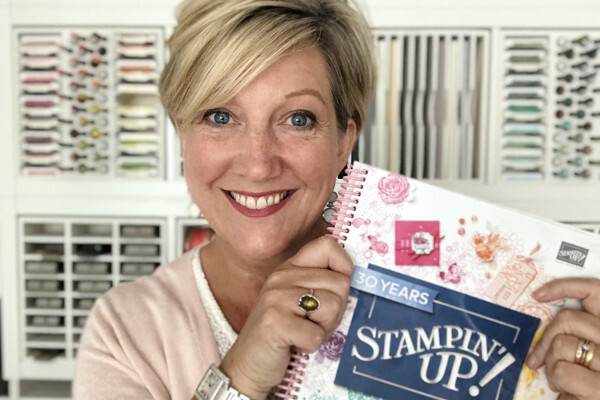 I have something lovely an bright to share with you today using the Gingham Gala Designer Series Paper from the new seasonal catalogue. It is a wonderful pack of bright and cheery gingham patterns with a larger print on one side and a smaller gingham print on the reverse. The pack as 40 sheets of 6×6″ in 5 colours – Balmy Blue, Daffodil Delight, Grapefruit Grove, Highland Heather & Lemon Lime Twist. If this does not make you think of Spring I don’t know what till? I created a rectangle panel for the front of the card and cut 1cm strips of the 5 colour of gingham paper and stuck them diagonally onto the rectangle. It was really simple to trim off the excess lengths which I then mounted onto a whisper white rectangle which was slightly larger to create a mount. I had a little play with the placement and added it off centre with some dimensionals. 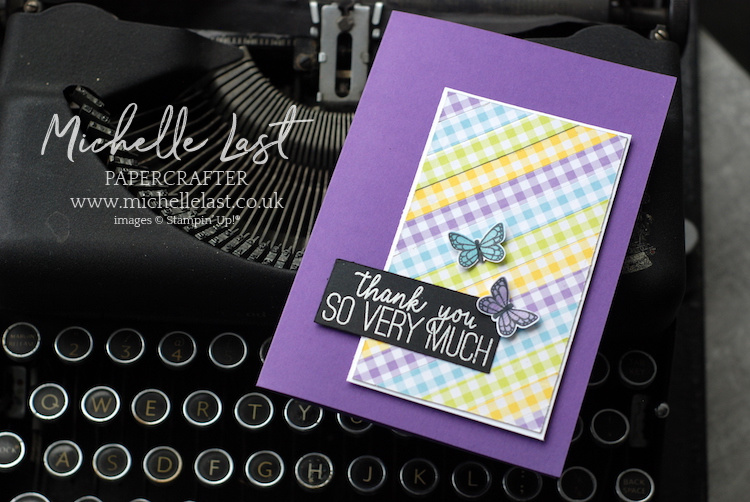 I could not resist using the whole Butterfly Gala bundle and I stamped the smaller butterflies and punched them out using the Butterfly Duet Punch. To make the sentiment pop I heat embossed the greeting from the Butterfly Gala stamp set in white on basic black cardstock but I could not stop there! As per my new years resolution (it is a record that I’m still following a resolution this far into January) I also made the inside pretty too! 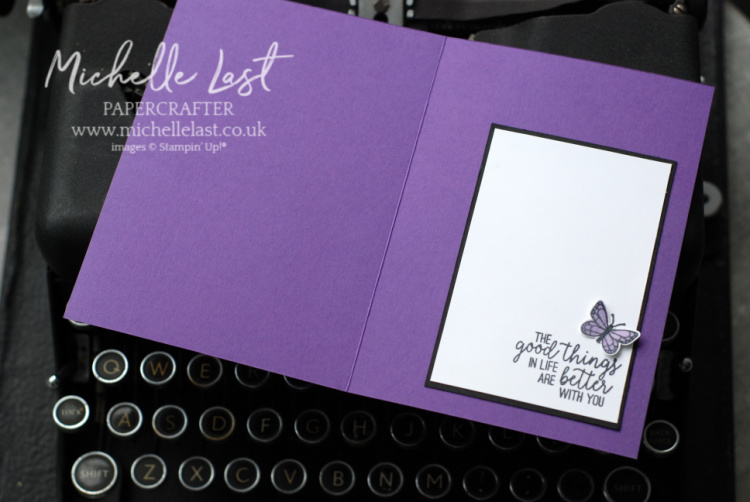 It is so quick and simple to punch out the butterflies from the Butterfly Gala stamp set, which is why it is one of my favourite bundles from the new seasonal catalogues. If you have not got a paper copy and would like one, please request a copy (button on my blog) and I will pop one in the post. I think it’s the first time i have used Gorgeous Grape as a card base too. Pretty bright and cheerful and very welcome on a day like today. We are also in sale-a-bration and for every £45 you spend you can choose a free item from our sale-a-bration leaflet. More details on the amazing Sale-a-bration offer can be found here or please get in touch if you have questions or need help. Why not choose the Organdy ribbon pack as it matches all the colours of the Gingham Gala Designer Series Paper. Coordination heaven right there! All the items I have used to make this card are shared below. If you click any of the images you can go direct to that item in my online shop and add it to your basket. If you purchases reach £45 you will automatically be prompted to choose a free item. And it is a free item with every £45 you spend so spend £90+ and choose two free items etc…. Please also remember to use the hostess code if you would like to receive a free thank you gift from me when spending £20+. That is in addition to the sale-a-bration freebies. Thank you so much for stopping by, I hope you have a lovely weekend.